The team here at True & Dorin Medical Group has helped countless patients with diverse hair restoration needs. Our team of experts located in and around New York, New Jersey, and Boston are here to help identify various hair loss causes and implement the proper restoration treatment. One cause of hair loss is actually not related to traditional pattern balding or trauma but rather hormonal deficiencies. This is known as hypopituitarism, which we'd like to cover in brief right now. Hypopituitarism is a condition in which the pituitary gland secretes a decreased amount of one its eight different hormones. This imbalance in hormone secretion leads to changes in a person's body. If the pituitary gland secretes a decreased amount of most or all of the eight hormones, this is known as panhypopituitarism. If you should notice any combination of the symptoms above coinciding with any of the causes that we have also listed, it's a good idea to speak with your general practitioner about these matters. You will be able to discuss these issues in more detail and undergo medical tests to determine if you suffer from hypopituitarism, panhypopituitarism, or another medical condition of some kind. In most cases, the ideal treatment for hypopituitarism is hormone replacement therapy. During diagnosis, the deficient hormone or hormones can be identified and injections of hormones can be administered as needed. Different drugs can be used to address the patient's needs, and these can be discussed in more detail with your general practitioner. Is hair restoration necessary for hypopituitarism-related hair loss? No, not in many cases. Since the hair loss is caused by a hormone deficiency or multiple hormone deficiencies, the use of hormone replacement therapy can promote hair regrowth as the body's hormone levels normalize. 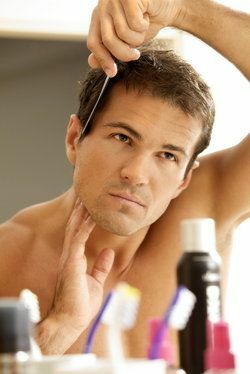 Hair restoration surgery such as follicular unit extraction (FUE) or follicular unit extraction (FUT) may be unnecessary, and the same goes for non-surgical treatment with medications such as Rogaine or Propecia. With this in mind, we do acknowledge that hair loss of various kinds can make you feel self-conscious. We would be more than happy to discuss means of masking your hair loss that are entirely non-invasive. You can also receive information from your general practitioner. Should hair restoration surgery be recommended, however, we will be sure to go over these matters in full detail so that you can make an informed choice about all of your options for care. To learn more about hair transplant surgery and other options for addressing hair loss and balding, be sure to contact our hair restoration specialists today. The team at True & Dorin Medical Group will be more than happy to go over all of your options for care so that you can have a natural-looking head of hair again.